When a small business really starts to hum, lives are changed and this was one of our favourite projects in 2017. Woodworker and educator Steve Mackay's business needed to find its feet again after moving from Auckland to Mangawhai. The benefits of build projects go far beyond woodworking skills. Confidence is gained, teams formed, co-operation established, problems solved and the almighty WOO HOO at the finished product is exactly the same for kindy kids as it is for corporate team building exercises. So, this is important stuff. We interviewed Steve about what he did and how he did it and realised that the enthusiasm, excitement and pride at the lives that have been changed by Steve Mackay weren't being conveyed by his site. 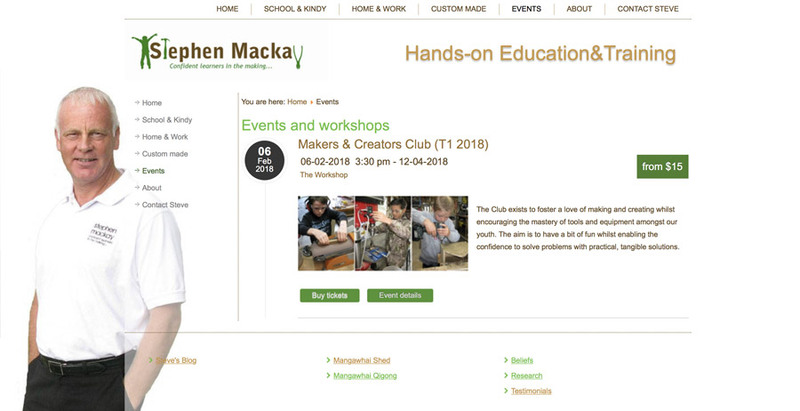 We rewrote big sections, installed a powerful event and ticket booking system so Steve could promote workshops, after school and school holiday programmes and did a heap of SEO work, which we submitted to Google and tweaked until it was doing its job. We then wrote a Facebook post for Steve to load. It took a day for the first school holiday programme ticket to sell and the programme sold out. So did the after school programme that followed it. Taking advance bookings with completed payment gave the business certainty of income and made it possible to pursue larger team building contracts.